Youth is wasted on the young. Often, money is, too. Back in my corporate days, when I managed scores of retail stores and hundreds of employees, I stressed the importance of planning for retirement—as well as saving for future goals—with every person I hired. Before the start of their very first shift, I would sit down with each new team member and show them how to save for retirement without stress, worry, complexity, or pain. Within a few minutes, I could literally see the difference in their physiology as trepidation drained from their facial features and, after we spent 30 minutes examining their options, confidence began to take over once they realized planning for retirement is much simpler than they thought. One day: these two words are dangerous because they give us an excuse to shelve important decisions that radically influence our future. Waiting for “one day” to arrive doesn’t solve the problem—it makes it worse. Each day we wait, the worse it gets. Just as with my employee orientations of yesteryear, I want this essay to serve as an inspirational and informative “sit-down” in which I clear the fog of decision-making and help you, the reader, make an informed decision based on what I’ve done with my own financial future. I truly believe that after reading this step-by-step process, you can plan for retirement in less than an hour. Using screenshots and my personal finances as a concrete example, I provide the necessary tools and a step-by-step strategy for you to quickly understand how easy it is to begin saving for retirement, regardless of where you stand on the socioeconomic ladder. Not only retirement, though—I also want to help you save for other future objectives: establish a Safety Net emergency fund, build wealth with smart investments, and own your house outright, if that’s a dream of yours. And most important—I want it to be simple, because I know, based on years of experience, if I can make the complex concept of retirement planning simple, then you have a much better shot at getting started immediately. Ultimately, I hope to eliminate the fear of financial planning and help you realize it’s simpler than you think. Myth 1. I’m too old to save for retirement. I frequently hired employees who were older than I was—often in their forties and fifties—with no retirement-savings plan. Fear had long ago set in, and they figured it was too late. They were stuck; they had missed their opportunity. Not true. While it’s true that you’re better off starting at age 25 than 50, it is also true you’ll be better off starting at age 50 than, say, 70. Then again, 70 is a better start than 90, isn’t it? The past is the past. We must stop peering at the rearview and instead look ahead toward the horizon. As long as you’re still breathing, it’s never too late to start. It’s never too early, either. Myth 3. I don’t make enough money to save for retirement. Actually, there is no reason you shouldn’t retire a millionaire. That’s right: virtually everyone, even minimum-wage earners, has the opportunity to be a millionaire when they retire. 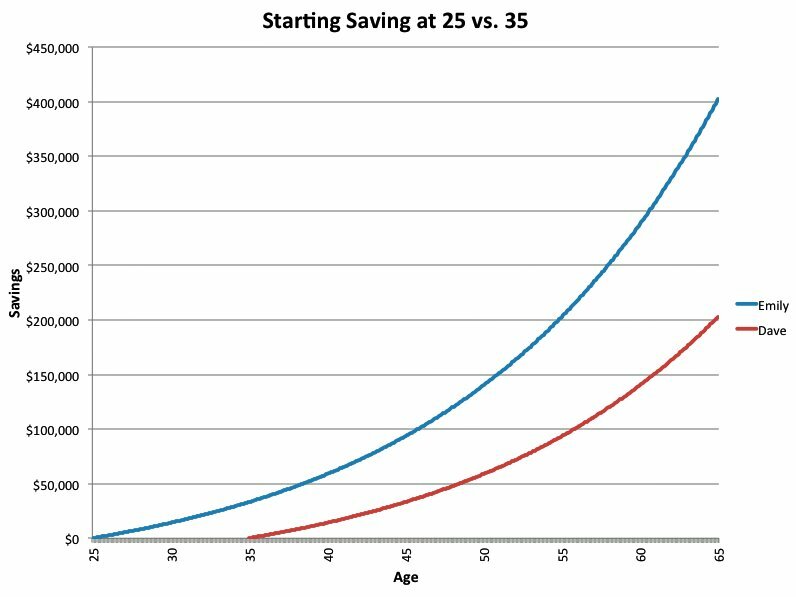 It sounds too good to be true, but the math proves otherwise: a 25-year-old who sets aside only $23 per week will retire with more than a million dollars if the money is invested properly (12% rate of return). Okay, so maybe you’re not 25 anymore—me, either! That’s all right—us older folks simply need to adjust accordingly. Betterment has an investment-and-retirement calculator to help you understand exactly how much money you need to save based on your age and financial objectives. Myth 4. Inflation will hurt my retirement nest egg. This is the only myth that is partially true; however, its truth is irrelevant. While it is true $100 dollars ten years from now will probably possess less buying power than $100 today, the flip side of that coin is also true, and considerably more important: your $100 ten years from now will be worth infinitely more than your friend’s $0 invested. In fact, solid investments are the only way to outpace inflation. It is better to invest your $100 than keep it in a bank or under your mattress. Myth 5. I’d rather spend my money on something else. When intentions are good, this excuse occasionally sounds like the most compelling reason to avoid saving for the future. True, we sometimes cling selfishly to money, using our income to purchase superfluous trinkets of ostensible success (new cars, shiny gadgets, accoutrements of consumerism), but frequently we want to use our money to contribute beyond ourselves (charities, nonprofits, and loved-ones in need). Contributing to others is certainly admirable, and I believe giving is living, so I want you contribute generously, but I’ve found the best way to help others is to help yourself first—the best way to give generously is to have more to give. Investing in yourself first helps you flex your giving muscle. There’s a reason airlines tell you to “secure your own oxygen mask before helping others”: if it’s easier to breathe, it’s easier to help people in need. Myth 6. The stock market isn’t safe. Translation: you don’t understand the stock market. That’s okay: I don’t completely understand the stock market, either—not intimately anyway (I am not a financial advisor, nor do I play one on the Internet). The only people who must have an advanced understanding of the stock market’s intricacies are stock brokers, day traders, and fund managers. Rather than allocating several hours a day to learn the nuances of mutual funds, index funds, and individual stocks, I choose to use an investing service that takes the guess work out of investing. It is true any investment introduces risk into the equation, but long-term investing in the stock market has proven to be the best way to grow your retirement savings: over the last 25 years, including 2008’s steep decline and subsequent Great Recession, the market has averaged a rate of return of nearly 11%. Even when you account for 1929’s Great Depression, the market has averaged greater than 9% growth over the past 100 years (source: Morningstar). Investing in the market is the most stable good-growth investment one can make in the long-term, especially when using online tools that help you outperform the market, many of which are discussed in this essay. Myth 7. I don’t have enough time or knowledge to manage my retirement savings. It’s true you and I will likely never have as much financial wisdom as the experts, but that’s precisely why we must seek out tools developed by trusted, reputable experts. Although I’m usually a do-it-yourself kind of guy, I don’t DIY my investment strategy; rather, I did my research and found online investment tools that allow me to control my money without being overly controlling. I don’t want to constantly scrutinize my investments—tweaking and reacting out of fear every time the market goes up or down—but I don’t want to fly blind, either. Rather than flying the plane myself, I put the best possible pilot in the cockpit. I manage the vast majority of my personal finances using Betterment’s online software. Easy to use. Because I avoid complexity, I knew whichever online-investment firm I chose, it had to be easy to use. Reputation. Betterment is the largest online automated investment service for a reason. Their portfolio is designed to achieve optimal returns at every level of risk. Through diversification, automated rebalancing, better behavior, and lower fees, Betterment customers can expect 4.3% higher returns than a typical DIY investor. No-cost setup and low fees. I am not a millionaire (at least not yet), so I can’t afford to waste money on setup costs and fees. Unlike many investment firms, Betterment does not charge to sign up for their service. That is correct: it’s absolutely free to establish a Betterment account. Better yet, their fees are the lowest around. I remember paying 300 basis points (3.00%) to my previous local broker, but now I pay only 15 basis points (0.15%). No, that’s not a typo: fees are often 20 times lower with Betterment. This is especially relevant considering the power of compound interest. By not charging for trades or transactions, Betterment manages their customers’ portfolios for far less than it would cost at even a discount brokerage; plus, their fees only get lower as your assets grow. Not only for retirement. 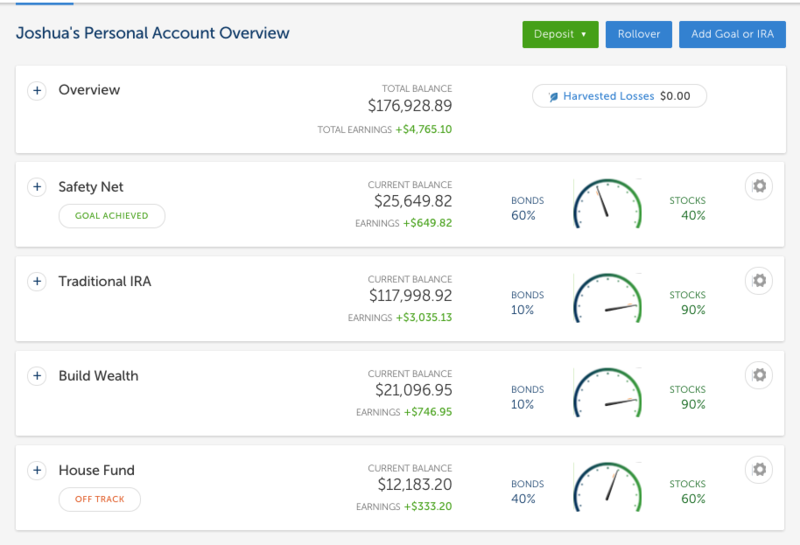 As you’ll see in the following Savings Strategy section, not only do I use Betterment for my retirement planning, but I also use it to house separate accounts for my personal Safety Net, Wealth Building, and House Fund. By deferring a little money from my checking account to my Betterment account each month, I keep myself safe from spending temptations. Because my money is invested appropriately, it grows more than it would were it sitting in checking or savings accounts. Automatic Portfolio Rebalancing. Remember that 90s cookware infomercial: “Set it and forget it!”? Well, I have very little desire to learn the mechanics of portfolio rebalancing and dividend reinvesting, but with Betterment, everything is automated—even deposits, if you’d like. Once I established my Betterment account, I was able to effectively “set it and forget it.” Sure, I still check in quarterly to take a peek at my financial growth—which is pretty cool because their web-based interface is beautiful—but I know the best strategy, once everything is set up, is to let the money grow and grow and grow without fooling with it. Beautiful interface. See “Easy to use” above. Betterment’s website takes all the clunkiness out of old-time paper-trail investing. RetireGuide. Betterment’s optional RetireGuide feature will make recommendations for your non-Betterment 401(k) and taxable accounts, as well as recommend what kind of IRAs you should fund. You can even look at scenarios comparing whether or not social security will exist in the future, since that is a major concern for many folks (myself included). This free feature even shows what kind of income you can withdraw during retirement. Diversity. Betterment uses years of investment research to construct a globally diversified, passive portfolio based on Modern Portfolio Theory. Their customers own exchange-traded funds (ETFs) representing up to 12 asset classes. In plain English: diversification is the key to properly managing your wealth through market upswings and downturns—Betterment provides this diversity. Free resources. For the casual investor like myself (read: non-expert), I appreciate the plethora of financial advice Betterment regularly doles out. Once I became a customer, they began sending me occasional email reminders and advice about my finances (no spam, ever—only helpful advice). It is the first time I can remember enjoying reading about finances—because they made it easily digestible and applicable to my personal situation. Today’s technology is making investing easier, safer, and simpler than ever. You used to have to hire a local broker and hope he or she had your best interests in mind. While there’s nothing inherently wrong with a local-broker approach (there are many wonderful brokers out there—I’ve dealt with several), I’ve found that I feel more informed, more confident, more focused, and more secure with the advanced tools being made available online in today’s investment industry; plus, I’m grateful to pay considerably lower fees, which helps my money grow more quickly (remember the power of compound interest). To be as transparent as possible, not only am I sharing my financial information in this article (including screenshots below), but it’s worth noting that The Minimalists used to be an affiliate partner for Betterment, but we opted out of that program recently because it restricted our personal ability to freely invest our money. That said, I still use Betterment to manage my money. Even though Ryan & I don’t have an affiliate relationship with Betterment, which means we don’t receive anything for recommending their service, their firm is the place I trust most to manage my investments. 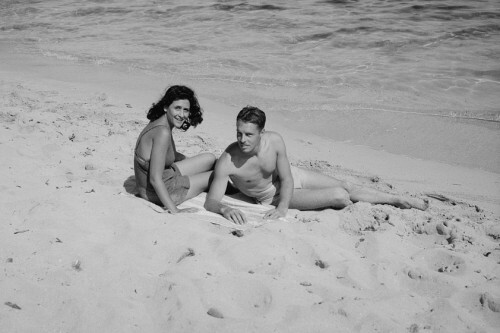 If that ever changes, I’ll update my viewpoint here at TheMinimalists. The best way for me to help you save for the future is to show you my recipe, that is, how I manage my own finances step by step: this way you can follow the entire recipe or select ingredients that work best for you. First, if I were to retire today, $176k wouldn’t be enough money because, ideally, one wants to have enough saved to live off the interest, pay taxes, and outpace inflation. Thus, if I wanted to bring home, say, $30,000 a year, I’d need to have approximately $500,000 saved, earning 12% interest (2% for inflation, 4% for taxes, and the remaining 6%—$30,000—for income). And second, of course, I’m not loaded. I don’t view this money as my money at all; instead, I look at it as an investment in my future self: it is my future self’s money. I’m not allowed to touch it. Besides, it didn’t happen overnight: I’ve been investing for nearly a decade, slowly contributing a percentage of my income each month with unwavering conviction. Even when income has been low, I’ve made sure to pay my(future)self first by investing in my retirement account and ensuring I have a Safety Net for emergencies. Tactic 1. Safety Net. Before planning for retirement, it is best to plan for emergencies. Life happens, so we must create an initial Safety Net bucket containing $500–$1000, invested conservatively to avoid downturns in the market. Warning: do not touch this money unless there is a true emergency (e.g., car repairs, home repairs, job loss, medical bills, and other real emergencies). In fact, this is why I keep my Safety Net in a Betterment bucket instead of in my checking or savings: by removing it from my regular bank account, I’m less tempted to use that money unless it’s an actual emergency, plus I still have quick access to the money should I ever need it. Over time, once you’re out of debt, your Safety Net will grow to include several months of expenses (after years of saving, my Safety Net now has a year’s worth of expenses and I no longer contribute to that bucket). But for now, worry only about the first $500–$1000 to start. Once you’ve built your initial Safety Net, you can begin piling cash into your Retirement Savings. Tactic 4. House Fund. One might say I’m “debt adverse”—but that is an understatement. I hate debt! From my viewpoint, after experiencing crippling debt for over a decade, there is no such thing as “good debt.” Sure, some debt, such as a mortgage, is better than other debts, such as, say, a creepy payday lender—but just because it is sometimes tolerable, debt is never a “good” thing. Hence, although I’ve been a homeowner before (well, technically the bank owned the home and I paid the mortgage), I currently rent an apartment and save additional money into my House Fund bucket, which is adjusted more conservatively than my Retirement Savings and Build Wealth buckets because the House Fund bucket is ideally a shorter-term investment (fewer than five years). For some people, this bucket is a great way to amass a reasonable downpayment on a home (a 20% or greater downpayment allows the borrower to avoid pricey Private Mortgage Insurance). For me, however, this fund is there so when I decide to finally purchase another house, I will do so in cash. As you can see, I have a long way to go, but I know it will be worth it. Tactic 5. Employer Contributions. If your employer offers an employer-matching, tax-qualified, defined-contribution pension account, such as a 401(k) (or 403(b) or 457(b) if you work for a nonprofit or government entity, respectively), then it is best to contribute to your 401(k) up to the employer’s matching amount. For example, if your employer matches your contributions up to 3%, then I encourage you to contribute 3% of your income because you’re effectively doubling your investment immediately (if your employer doesn’t match, however, then I would avoid an employer-based retirement account because there are better, more flexible options available). After the match, however, I recommend using an investment service like Betterment, or any of the others I’ve mentioned, because they give considerably more flexibility, control, and guidance, and thus a greater return on your investment compared to most 401(k) plans, which are usually terribly limited. Personally, because my company is a small business (an LLC partnership with only a few employees), we established an SEP-IRA through Vanguard—our company went to Vanguard directly because Betterment allows only individual accounts (no business accounts). Much like a 401(k), SEP-IRAs are often adopted by small business owners to provide retirement benefits similar to a pension plan for the business owners and their employees. Tactic 6. Contributing to Others. Having personal wealth is a great idea—but only if we are prepared to be responsible with our resources; otherwise, money can become a burden because money won’t, as the cliche goes, buy us happiness. Sure, it will purchase myriad comforts, but comfort and happiness aren’t necessarily synonymous (in fact, comfort often keeps us from true happiness). 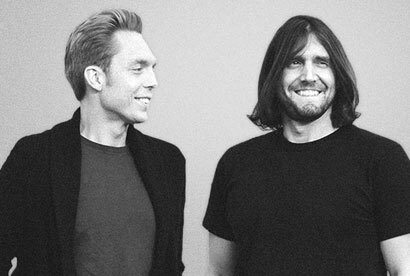 Although The Minimalists had a breakthrough year last year (a bestselling book, a 100-city tour, etc. ), Ryan and I decided to pay ourselves considerably less money than our business generated, opting instead to invest in other people and causes. We could do this contently only after ensuring our own financial house was in order, which enabled us to save more than 20% of our personal incomes while still contributing a considerable amount—well over 20% of our business revenue—to others. Giving is living: let’s build wealth so we can give more and live more. Whether you use my tactics or not, I’d be remiss if I didn’t warn you about the investments I avoid. Cash-value life insurance. Cash-value plans, such as whole-life or universal-life, are horrible investments. Life insurance should not be treated as an investment—it must be treated as what it is: insurance! If you have dependents, then yes, you need life insurance (unless you are wealthy enough to self-insure), and your best bet is always term-life insurance. Additional reading: The Truth About Life Insurance. Individual stocks. Unless you are an expert day trader, individual stocks pose too much risk to the average investor. Even if your employer offers a “special” rate for their stock, I wouldn’t invest my money into any single stock, not even reputable stocks like Apple or Google: it’s simply too high-risk for my taste. I want my money to grow over time, preferring to “get rich slowly” over “get rich quick,” the latter of which usually leads to a perilous outcome. Gold, silver, and precious metals. Like individual stocks, these metals are too fraught with risk when compared to index funds. Even worse, gold and silver are commodities—commodity prices are often manipulated by speculation rather than supply and demand. Additional reading: The Gold Market Is Losing Its Glitter. Annuities. Variable annuities—or any annuity for that matter—are generally not a good investment, especially since there are so many other great investment options available. More often than not, annuities are rife with fees and penalties and surrender periods, not to mention low rates of return. Yuck! Low-interest-yielding investments. If you’re investing for greater than five years, then low-interest-yielding investments, such as CDs, savings accounts, individual bonds, and the like, are poor investments because the interest earned usually doesn’t outpace inflation. These are great options, however, if you’re saving for less than twelve months because they reduce your overall risk. By this point, you should have some financial clarity and a noggin full of good ideas—so don’t leave the scene of a good idea without taking action! You need momentum if you want to keep going. Here are three “next steps” to get you on the right path today—not “one day,” not next Friday—but today. Investment account. Using Betterment or another online broker, set up an account today. Even if you don’t have a single dollar to commit until next week or next month, that’s okay. Establishing a free account is a proper first step. Start small and automate. Beginning with your next payday, automate regular deposits directly from your checking account. Start small: you won’t notice a 2% pay cut. Every month or so, increase your contribution by 1%. Within a year, you’ll slowly ratchet up to nearly 15% of your pay, which is a great place to be. I employed this strategy in my life, slowly increasing my percentage 1% at a time, and I now save at least 20% of my income (often considerably more than 20% by making additional deposits whenever I run into additional money). Build your Safety Net first, and then start investing into your Retirement Savings bucket as soon as you have at least $500 in your Safety Net bucket. Public accountability. Once you have an investment account established, and have started contributing to it (no matter how little), share your newfound vigor with the world around you: tell a loved one, family member, or trusted coworker (someone who will congratulate you rather than judge you). If you like, you can share this article on social media or with coworkers to spark a discussion in your immediate circles. Discussing your financial objectives with other people helps you keep yourself on track. There is no single “best way” to plan for your financial future; rather, there is an entire landscape riddled with peaks and valleys you must navigate. It is my desire this how-to guide acts not as advice (which it’s not), but as a roadmap to help you on your journey toward a financially secure future. If you walk away from this essay with only one takeaway, I hope it’s this: start today. Don’t let your crastination turn pro. Whether you use Betterment, Wealthfront, or your own personal broker to manage your money, the most important thing to do is get started. According to the ASPPA, the largest indicator of retiring with wealth is not your financial philosophy; it’s not your suit-n-tie, slick-talking broker; it’s not even your rate of return—the primary indicator of having money when you retire is your savings rate. That’s right: putting money away—starting today—is the best route to financial freedom during retirement. While I am not a financial advisor, it is my aspiration the financial tools and strategies shared in this article will give you the push you need to get started and feel confident in your financial future. I wish you way more than luck.